Charl Johnson is back on the stand today for more cross-examination from Roux. Once again, Roux is trying to get Mr. Johnson to say that he and his wife collaborated on their testimony. He explained how he gave his statement to police, which was separate from his wife, and what he is testifying to today is what he originally stated to police. The notes that they were looking for yesterday have been found. Roux wants to review them. He goes through several lines to try to point out where Johnson is now embellishing his testimony. Roux actually goes so far as to say he has “designed” his testimony for court. Mr. Johnson points out to the judge that he has absolutely no reason or incentive to design his answers for the court. Two important points that Mr. Johnson gets in to testimony today is that he is a gun owner, so he is very familiar with the sound of gunfire. He holds steadfast to the fact that what he heard that night around 3:17am was gunfire. Second, he also testified that he heard female screams and male screams occurring at the same time. This contradicts Roux’s argument that Oscar was screaming so loud that he sounded like a woman. No way for Oscar to make his voice sound like two different people. Roux wants to eat Mr. Johnson alive, and has tried to for two days now, but Mr. Johnson was solid. Mr. Johnson is excused. Next witness up is Dr. Johan Stipp. He is one of Oscar’s neighbors in Silverwood Estates, but does not personally know Oscar. 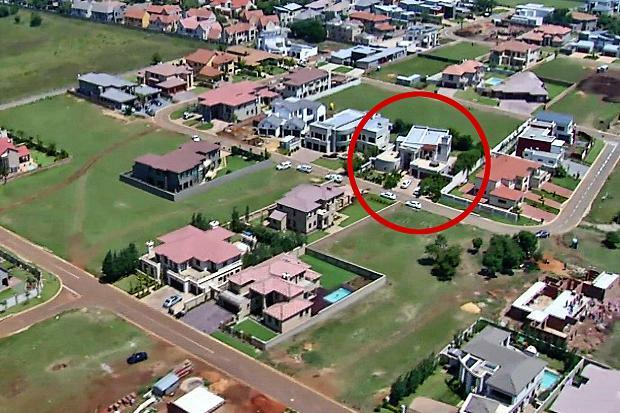 His house is located at the back of Oscar’s about 72 meters away. Dr. Stipp’s bedroom directly overlooks Oscar’s bathroom windows. See the image below to find the vantage point of Dr. Stipp. Oscar’s house is circled in red. The windows to the bathroom where the shooting occurred are on the back side of Oscar’s house on the left side. If you look directly across the field at the back of Oscar’s house, the house with the orange roof is Dr. Stipp’s. The window above the garage is their bedroom. That window is actually a door that opens to a small balcony. To the right of that around the corner is another larger bedroom balcony. Dr. Stipp looked from both balconies that night to see what was going on. The larger balcony has a slightly better view around the trees in Oscar’s backyard. Dr. Stipp was home on the night of February 13, 2013, along with his wife, three children and domestic servant. He went to bed around 10:30pm that night. Both bedroom balcony doors were open. During the night he was awakened by 3 loud bangs. His wife asked him “what was that” and he replied “I think it was gunshots”. He got up out of bed and went out on to the balcony. He then heard screaming which sounded like a female. She screamed 3 or 4 times. He later states in his testimony that she sounded extremely fearful. All of this happened within a matter of short moments. He noticed that the house directly to the right of Oscar’s had all of their lights on. And in Oscar’s house, the bathroom light was on. Dr. Stipp went back inside and called Silverwood security. There was no answer. So then he called 10111 (not sure what this is), got a fast ringing. While he was trying to figure out who to call next, he heard another 3 loud bangs. He thought that these also sounded like gunshots. He told his wife to get away from the window, fearing for her safety. He eventually got through to the security. He reported what he heard and they said they would send someone. He was pacing around his room at this time. He went back out on to the balcony again. He then heard a man shouting “help” three times. He went back inside again. Security arrived a few minutes later at the Stipp house in a vehicle. Dr. Stipp spoke to them from his balcony. He told them what he heard and where it was coming from and they left to go investigate. Dr. Stipp watched them as they drove off. He looked back over at Oscar’s bathroom window and could see somebody inside moving from the right to the left. He discussed with his wife if he should go over there to see if they need help. He first drove down to security to make sure it was safe to go there and they said yes, they have already sent somebody there. Dr. Stipp drove to Oscar’s house, he parked, and there was a man (Mr. Stander) speaking on a cell phone leaning against a white car in the parking lot. That man motioned him toward the front door. There was a lady standing in the doorway (Stander’s daughter). He stated to her that he was a doctor, can he be of assistance, she said yes and walked him inside. 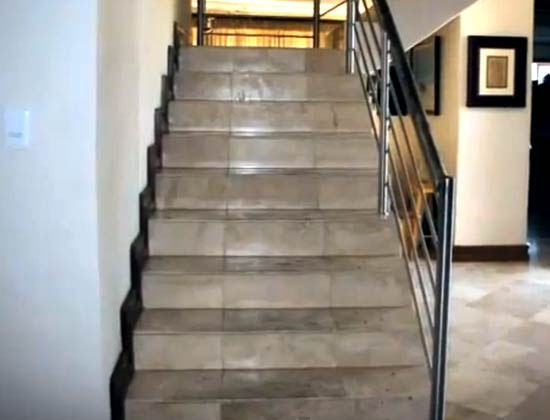 At the bottom of the stairs Reeva was lying on her back on the floor. As he bent down, he noticed there was a man to her left kneeling next to her. He had his left hand on her right groin and his right hand second and third fingers in her mouth. Oscar said “I shot her. 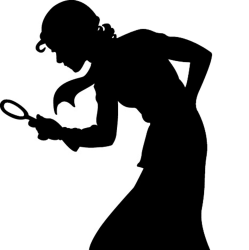 I thought she was a burglar and I shot her.” Dr. Stipp tried to assist her. He checked for pulses and could not find any. She had no breathing movements. She also was clenching down on Oscar’s fingers as he was trying to open her airway. He tried to do a jaw lift maneuver which was very difficult due to the clenching. He opened her right eyelid. Her pupil was fixed dilated and the cornea was milky. It was obvious that she was mortally wounded. He also noted that she had a wound in her right thigh and a wound in her right upper arm. On the right area of her skull was hair, blood and brain tissue. It was a very severe, fatal injury. 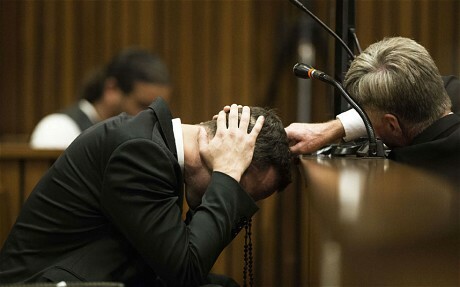 Oscar sobbed loudly during this testimony and had his head hanging low. Oscar was crying all the while Dr. Stipp was there that night. He was praying to God “please let her live, I will dedicate my life and her life to God if you will just let her live.” Dr. Stipp went outside and asked Mr. Stander if the ambulance was on their way. He said no, he hadn’t called them yet so Dr. Stipp called the hospital emergency department and asked them to send an ambulance. They told him he had to call an emergency number, not them directly, so Mr. Stander called an emergency number. Dr. Stipp spoke to the dispatcher, explained the injuries, and they proceeded to send out an ambulance. At one time when Dr. Stipp was outside talking to Mr. Stander, Oscar went back upstairs. Dr. Stipp asked Mr. Stander where the gun was located because he was afraid that Oscar was going upstairs to kill himself. Mr. Stander said he didn’t know where the gun was. Oscar came back a few minutes later. Mr. Stander’s wife arrived at some point. They were all outside talking and Mrs. Stander made a comment that she hoped this didn’t get out to the papers. The ambulance arrived a short while after. Dr. Stipp told Mr. Stander that he was no longer of use so he would go back home and they exchanged phone numbers. Dr. Stipp got in his car and drove back home. He told his wife what had happened. They tried to get a little rest after that but at 4:17am the phone rang and it was Mr. Stander notifying him that Oscar’s lawyer may be calling him shortly to discuss the incident. He never received any calls after that. The next morning Dr. Stipp went to work. His wife called him around 9am and she told him that the woman who was killed the night prior was Oscar Pistorius’s girlfriend and you were in Oscar’s house. Dr. Stipp knew that Oscar lived in the neighborhood but he did not know that was Oscar the previous night. He was surprised to hear this news. Nobody ever contacted Dr. Stipp that day to question him which he thought was unusual. The next day, he went down to the security gate and asked the estate manager for a phone number for a police officer so he could give a statement about what he witnessed. The officer that he called met him at the hospital where he works and took his statement on February 15. A few months later, he made another statement to detective Van Aardt. Dr. Stipp also testified about his experience with guns. He has prior army experience and was trained on an assault rifle and a 9mm pistol. So he is familiar with gunfire noises. Going back to the screams, when he heard the woman initially screaming he believed he could also hear a man’s voice at the same time that sounded lower. He believes he heard two different voices at the same time. This is similar to what Mrs. Burger and Mr. Johnson said. Voices were intermingled. Dr. Stipp is asked if he saw the police at Oscar’s house after the incident and he says no, they didn’t arrive until after he had left to go back home. I believe this is important because there was a fair amount of time from when the shooting occurred to when police arrived that the scene was not secure. Dr. Stipp states that he also heard the yelling noises at Oscar’s house on February 21, 2014, which were the screaming tests that were being conducted by the defense prior to trial. He couldn’t hear what they were saying but he could hear the yelling. Roux cross-examines. This is an important point for the defense. He is pointing out to Dr. Stipp that the second set of bangs that he heard that night coincide with the bangs that Mrs. Burger and Mr. Johnson heard at 3:17am that night. We know that there were only 4 gunshots that went off that night. We also know that at some time after the gunshots, Oscar broke a panel out of the door with a cricket bat. The defense’s position is that the shots came first, the female screaming that came next was actually Oscar crying out in grief, and the second banging noises heard (the ones at 3:17am) were the cricket bat. But Dr. Stipp feels very certain that the second round of bangs that he heard were shots. The bangs were close in succession and it’s more likely that a gun would create that noise so quickly, not a hand-wielded bat (paraphrasing). So it begs the question, what was the first set of bangs that Dr. Stipp heard that woke he and his wife? My own theorizing here, but we know there was a cricket bat involved somehow in this event. Oscar states it was only used to break open the door. Maybe it was used in an earlier argument? Maybe he banged on the door or something else while they were fighting, Reeva runs to the toilet room and locks herself in out of fear. Oscar runs to get the gun, all the while the neighbors hear her screaming in terror, and then Oscar shoots her through the door. Just my own theory of what could have happened that fits what everybody heard. It makes sense to me that the Stipps could have heard additional banging because they were closer than the other witnesses. Burger and Johnson very likely only heard gunshots because of their distance. It makes no logical sense that they would hear wood banging on wood, but not gunshots. Back to the cross-examination, Roux is trying to suggest to Dr. Stipp that there was a decent period of time between when he heard the first bangs and he got out of bed to go to balcony, made a call to security, and then heard the second set of bangs. Roux needs all of this to happen in approximately 2 or 2 and a half minutes to fit Oscar’s timeline. Dr. Stipp is explaining to Roux that all of this happened very rapidly. There were no long delays or lengthy conversations in between, it all happened very quickly. Roux is now going back to Dr. Stipp’s original statement to police on February 15, and his testimony today, somewhat accusing him of not being entirely clear about what he witnessed. He has done this with every single witness… accusing some of flat out lying, accusing some of being confused, accusing them of changing statements, etc. Basically he has told almost every witness that what they heard was incorrect. I can’t fault him too much on that because if the Judge gives full weight to these witnesses, Oscar will be crushed. It’s fascinating to me to see how different this South African court is from an American court. The lawyers seem to be able to make broad sweeping accusations at witnesses and it’s allowed. This would not happen in American courts. They would be admonished by the Judge. You certainly can question a witness’s credibility, and you should, but you can’t badger them. You can’t repeatedly tell them that they are mistaken about what they witnessed. That’s not up for a lawyer to decide, it’s up to the Judge (or a jury in the US) to decide. The other thing that is interesting is that the lawyers are able to make statements within their questioning, which is odd. Opening and closing statements are typically where you hear the lawyers give their theories. These lawyers seem to be able to interject their own theories and beliefs in to their questions and almost state them as fact. It’s very different here. So going back to Roux’s timeline, if the first set of bangs were gunshots which the defense says they were, there could not have possibly been a female screaming afterwards because of the fatal nature of the head wound. There would be no way to account for the screams that Dr. Stipp heard in between bangs. That means either two things: the first set of bangs that were heard were not gunshots and were something else, or, they were gunshots and the screams that were heard were indeed Oscar’s screams that sounded like a woman (heard by 4, maybe more, witnesses). When this dilemma is put to Dr. Stipp, he replies that perhaps the cricket bat banging happened first and the gunshots last. Roux explains that this is not possible because the cricket bat broke out the panel in the door but there were gunshot holes in that panel, so the shots must have come first. We have not seen the ballistic reports or the reports on the door yet in the trial, but Roux also adds that there were splinters from the door lodged in the deceased. Roux goes back to his argument that the only possible scenario is that the female screams heard were actually Oscar. He has sound experts who tested his voice and will come to court to demonstrate to everybody how he sounds like a woman. That should be interesting! Dr. Stipp yet again points out that he heard two different sets of voices intermingled. And poses back to Roux “am I to believe that he was screaming in two voices or two tones”? Roux’s only defense back is that the doctor is mistaken about what he heard that night. 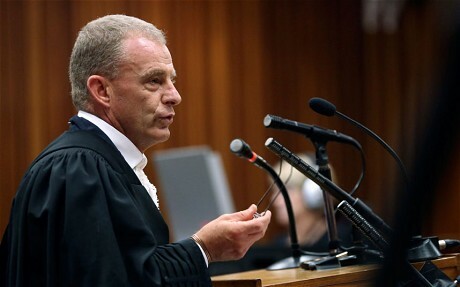 Finally… Nel objects to the Judge that Roux is stating theories as fact. They argue a bit about which set of noises actually killed Reeva, and Nel wants to clarify to the court that the state’s position is the shots heard at approximately 3:17am are the shots that killed Reeva and there would be no screaming after. The defense’s position is that the first set of bangs heard prior to 3:17am are the ones that killed Reeva, therefore the screaming after could not have been Reeva but only Oscar. That in a nutshell is the difference in cases. That is why these ear witnesses are so crucial. And needless to say, ballistics will be crucial too. Seems like they need to figure out what it was that Dr. Stipp heard banging prior to 3:17am. Cross-examination continued and Roux wants to know again Oscar’s emotional state when the doctor first saw him that night. Dr. Stipp states he seemed very sincere, he was crying with tears on his face. Praying to God that she would live. He wanted Dr. Stipp to help her and he appeared to be actively trying to assist her. They look again at the exterior pictures of Oscar’s bathroom windows. Roux points out that the glass on the window is frosted and the view is slightly obscured by a tree. Dr. Stipp points out that he was on the large balcony looking at the house and that view is better than the small balcony. He did see a person’s silhouette moving from right to left in that window. This is important because it will come up at some point in the trial whether or not Oscar was wearing his prosthetics at the time of the shooting. If the neighbor can see somebody moving in that window, you have to wonder how tall that person was. They will no doubt be looking at measurements at some point. But it sounds like Dr. Stipp saw this figure after security arrived (so after all the commotion) and Oscar did state in his affidavit that he put his legs on after the shooting, so it might not be such a revelation after all. We’ll have to wait and see. Here is an inside view of the toilet room. This is one of the photos that was leaked to the public back in 2013. And this is another view of the layout of the bathroom. The windows would have been to the left of Oscar as he is shooting in to the bathroom door. The other very important point that came up was that the bathroom light was on DURING the screaming. Dr. Stipp saw the bathroom light on, but didn’t notice the toilet room light on. If Reeva was simply in the toilet with the door shut and locked, doing her toilet business, why wouldn’t she have the light on? I would imagine that small, closed space would be very dark at night. Now, the toilet window is much smaller than the other bathroom windows so it’s possible that the light doesn’t shine through as brightly. Perhaps it was on and Dr. Stipp just didn’t notice. I don’t know. But it would be odd if we find out that the toilet room light was off when the police arrived. Why would she be in that small enclosed space with the door locked and no light on? Was she hiding? Another thing that’s food for thought… Dr. Stipp heard the female screams and heard the 3:17am shots while the light was on. 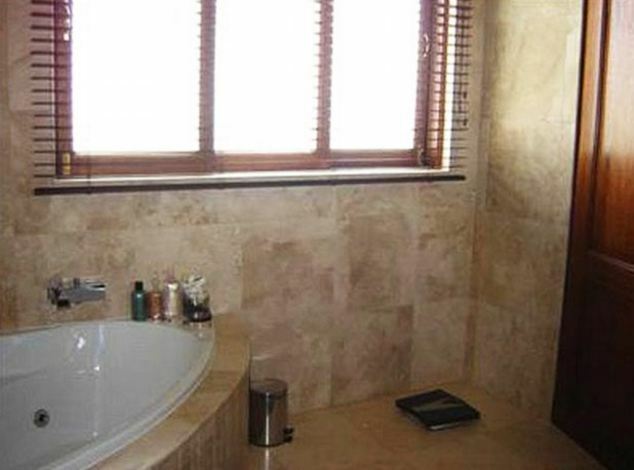 If these were supposed intruders in Oscar’s home, why would they have turned the bathroom light on? Doesn’t seem likely that intruders would do that. And Oscar specifically stated in his affidavit that he was too afraid to turn the light on at this point. Another revelation that Dr. Stipp pointed out in court was that the initial screams (the intermingled ones) that he heard from his balcony while the bathroom light was on was close by meaning that it was likely coming from the bathroom. The subsequent male scream heard later of “help, help, help” sounded much further away and off to the left. (that would probably be Oscar’s bedroom balcony.) A clear differentiation in voices and locations. They adjourn for the day. I just wanted to point out that, as I mentioned previously, the toilet door has no door handle which is not uncommon in RSA. It has a double-lock which requires keys to be used to open the door both from the outside and the inside. Actually, there is a door handle that can be seen inside the door. I can’t confirm if there is one on the outside, but I would have to imagine that there is if there’s one on the inside. Check out pic # 4 in the crime scene photos at this link. You can see the silver handle at the top left of the pic where the door panel is ripped out. There is definitely a handle on the door. Yep. At the beginning of trial, we only had the leaked photos of the door to work with. But now we have that door photographed every which way from Sunday. Going back to Dr Stipp seeing a silhouette moving across the bathroom window, which led to speculation that OP was on his prosthetics – something that was pretty much knocked for a six when the examination of the markings on the door which has backed OP’s version that he was on his stumps. Since Stipp gave this evidence, which left some unsolved question marks, a new person has entered the arena – Frank. Is it feasible that the silhouette could have been Frank? Frank could have let himself into the house when he heard the arguing and then the progression of the argument and finally the shooting. 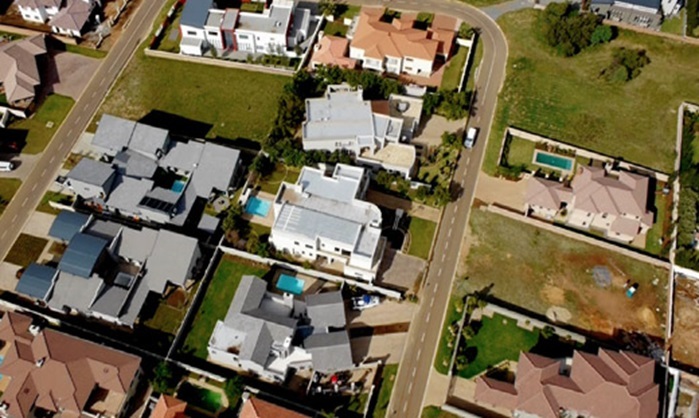 It is usual, in South Africa, for the domestic live-in employee, to have keys to the house. Am I way off base here or could this explain Stipp’s observation? I must congratulate you on your blog which is outstanding. Thank you. Regards, Karin. Thanks, Karin! No, I don’t believe it was Frank in the bathroom. I believe it was OP on his prosthetics. How does one explain that Burger/Johnson placed the male screams of ‘help help help’ BEFORE the gunshots yet Stipp’s places them AFTER the 2nd set of gunshots ? this is important because from OP’S evidence his yelling “help” from his balcony came BEFORE he banged down the door with the cricket bat , the 2nd set of thud sounds could NOT be the cricket bat banging on the door( that had not occurred yet) by Oscar’s own written and verbal evidence. Correction: (banging had occurred already). I now have the answer to my post from May 29. The Burger’s heard ‘help help help” BEFORE hearing the cricket bat banging down the toilet door, which is in line with OP”s version. If I were hiding from someone in this bathroom I would not sit on an open toilet. I would either put the lid down or more likely crouch in the space between the toilet & the wall. 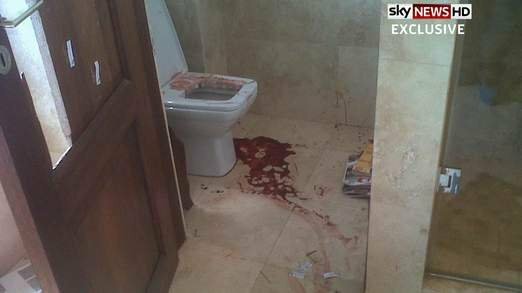 I know it’s unpleasant, but is there evidence that Reeva had been actually using the toilet? Physical evidence or what was she found to be wearing? Was her bottom half exposed? She was wearing shorts & a tank too. The shorts were on in their normal position. She was standing upright in front of the door. As Nel argued, likely communicating with OP thru that door when he fired. Her bladder was found to be nearly empty, which indicates she did relieve herself . Most people’s bladder are not empty at 3 am. I don’t believe that the contents of her bladder proves anything either way. The bladder voids automatically when you die. If they had been awake and arguing, she could have emptied her bladder at any time prior to the shooting. William, where did you get that fact from? in any case , the prosecutor has the onus to prove beyond a reasonable doubt and they did not. A simple Google search will reveal the commonly-known biological fact that all the muscles in the body, including the sphincter muscles and of bowels and bladder, relax at the time of death. This was certainly my experience when I dealt with dead bodies during my time in the military. Relaxing muscles upon death has nothing to do with urine in the bladder. I think you need a biological course. Nel never argued that her bladder was nearly empty. With all due respect Rita, I think it’s you who requires a basic biology lesson, so here it is: the bladder and bowels are controlled by MUSCLES known as sphincters. When we die ALL the muscles of the body (including the sphincter muscles of the bladder) relax and the bladder and bowels empty. 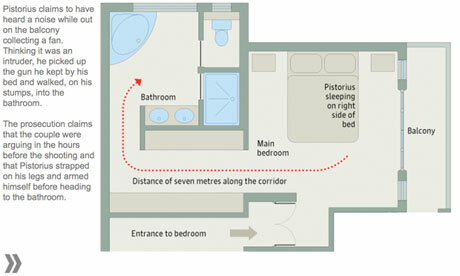 As I said, the amount of urine found in Reeva’s bladder during the post mortem is meaningless.